At the Pyramid Way and McCarran Boulevard Improvement Project Neighborhood Meeting last evening, I had the opportunity to review the landscape and aesthetic options for one of Sparks' busiest intersections. These options are also available for viewing on the pyramidmccarran.com website. 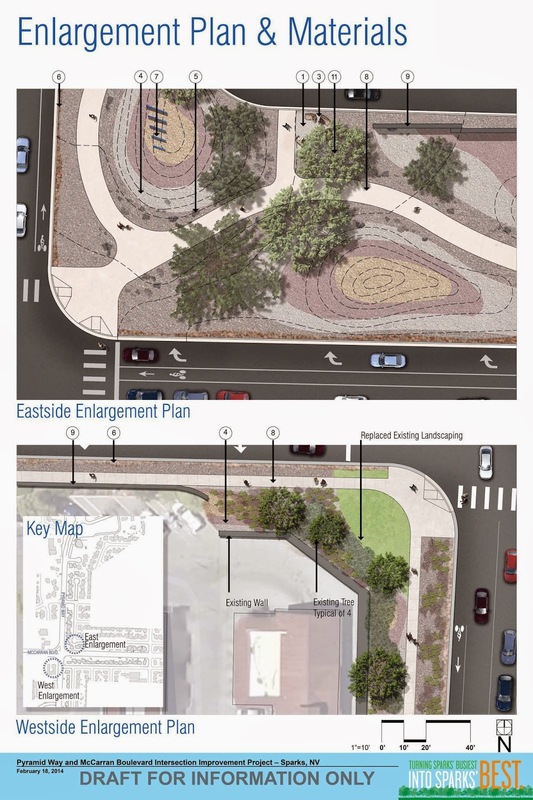 There is no doubt that the improvements will definitely give the corridor a sense of place and visual interest and hopefully it will address the issues for the surrounding neighborhoods and users of the busy intersection. I had the opportunity to speak with the RTC Project Manager, Scott Gibson. I was concerned that with all the landscape designs and road improvement plans that the bike lanes would be forgotten or compromised in the interest of time and space since the designs did not mention or illustrate the details of the bike lanes. After speaking with Scott, I was comforted in knowing that he is an avid cyclist and serves on a bicycle and pedestrian committee so there is someone in the RTC who would look our for the safety of bicyclists. He even uses RenoTracks! I let him know that my husband and I are also avid cyclists and that I commute by bicycle regularly between our home in Sparks and where I work along McCarran--to which he responded that I was "brave". I learned that improvements would be made on Pyramid north of McCarran where there are currently no bike lanes and in some places the bike lanes will be a generous 8-feet wide. If you would like to review the plans, this is the handout from the meeting Turning Sparks' Busiest into Sparks' Best handout.pdf I am told by another RTC project member that there will be another public meeting in the future with an opportunity to review the final designs. The construction will most likely being in Spring 2015 (so I will need to take an alternate bike route to work). Comments can be emailed to info@pyramidmccarran.com with a reference to the "Pyramid/McCarran Intersection Improvement Project" in the subject line. Comments will be accepted until 5 p.m., Thursday, March 6, 2014. You can also mail the Comment Form.pdf to the address specified on the form or submit comments online.